It sounds like Teyana Taylor has moved onto bigger and better things in her love life as rumors circulate that she’s snagged Iman Shumpert. Is it safe to assume that Teyana’s no longer worried about Brandon Jennings? Yes. Yes, it is. The “Google Me” singer didn’t name any names at the time, but the couple may have told on themselves. 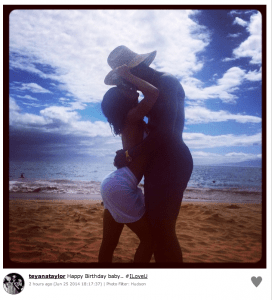 Teyana shared a shot of herself kissing her unidentified boo on Instagram, writing, “Happy Birthday baby.. #ILoveU.” Well, guess what? Today is Iman’s birthday and the man in the relfie (that’s a relationship selfie), has a build similar to Iman’s. This entry was posted in Uncategorized and tagged Iman, Love, New Boo, Teyana Taylor on June 27, 2014 by aajent837.